When Jane (not her real name) first attended an annual event which I organised, she was at a pivotal point in her career. She was transitioning from a salaried role into a freelance role and was a little apprehensive about the switch. Coming to this event had meant using up part of her exit-package, so she was determined to make it count. The problem was, after one day of the two-day event, she was frustrated: the topics weren’t what she needed, she was finding it hard to see if there was a market for her skills and it all seemed a bit chaotic. In desperation, she came to the team to ask for a refund on the second day. After she explained her situation, I asked her what she wanted to offer to clients and what she needed to get out of the event. I then suggested she propose a topic to attract people who were interested and then follow up with a few participants immediately after, on a one-to-one basis. Suddenly, she saw the potential of the Open Space event model and resolved to put the plan into action the next day. An Open Space event is one which participants (not attendees nor delegates) co-create the agenda based on topics they raise. These topics are assigned to times and rooms. Other participants then select which they’d like to join, in contrast to an event where content has been pre-populated by the events team. One participant agrees to kick-off the topic (becoming the convenor) and the group self-facilitates. Occasionally the group has different interests or is too large and they split into smaller groups to discuss. Some people might also wish to join several groups. ‘Floating’ between a few is encouraged and is not considered rude. Essentially, open space gives everyone permission to pursue their interests and in doing so, they find others who share those interests. Yet the real secret of a successful Open Space event is not in its facilitation, but in its design. 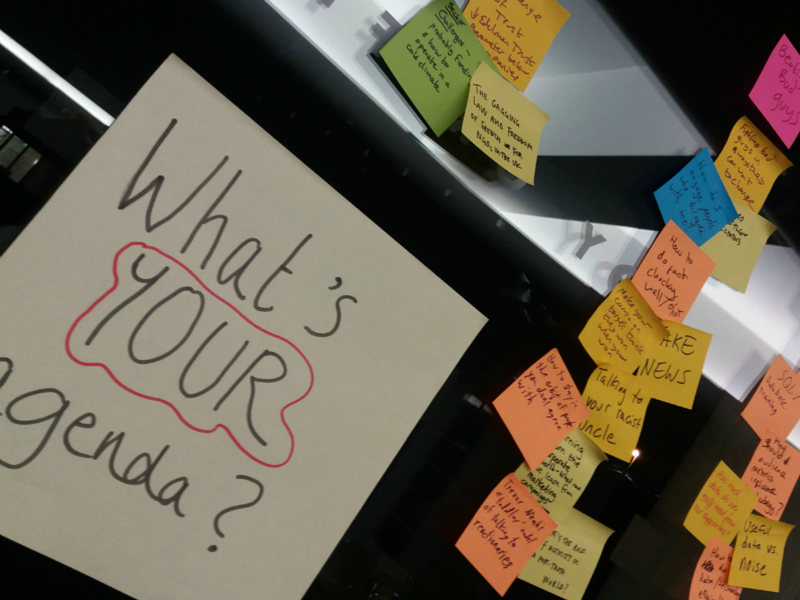 Many people experience the simplicity of an Open Space event and think it is just about creating a space to let people propose topics and self-organise. In reality Open Space is about the people in the room. Because the event is focused on the participants, the needs of those people are catered to first. This is why having common purpose and a unifying focus is essential to the success of open space events. It’s also important for participants have diverse experience but with shared interests so that serendipitous learning and connections can occur. The Open Space model is more than 30 years old. It has been used to organise thousands of events. You may have heard of Unconferences, Hackathons, Birds of a Feather and other names, all based on the idea of open space. In fact, the idea of crowdsourcing expertise (as well as funds and work) is a defining idea of our times. The big challenge for event organisers is taking a leap of faith in participants and the process: a big risk if you haven’t seen it work before! Even I’m nervous about it each time, despite having worked with it for more than two decades. So what happened to Jane? The next day she was like a completely different person with a fresh energy. She proposed her topic, attracted a dozen participants, ran the discussion with them, got new insight, made new connections and left the event feeling ready to face freelancing. She was nervous, but once she understood the event was there for her to mould, she seized the opportunity and made it work for her. I was happy that it worked. I never want people to leave the event dissatisfied. While open space may not appeal to everyone, my experience is that it puts people at the centre of the event. The way we absorb information is ever-changing and online learning is becoming increasingly popular and user-friendly. However, online learning is no substitution for the benefits of convening a group and spending time connecting and sharing in person. It is this in-person connection that matters most for establishing and renewing a relationship, after which the online relationship flourishes. Join Duane at ECF Europe for two days of Open Space, perfect for campaigners and fundraisers needing digital strategies and practices. ECF Europe takes place this year on 26-27 October in Berlin. Experience Open Space at CharityComms’ next digital conference this October. Duane Raymond has organised the popular eCampaigning Forum (ECF) in Oxford since 2002 based on open space principles. A sister event is also organised in Berlin (ECF Europe) at the end of October each year and it has also inspired other events in Australia (Fwd), Germany (re:campaign), Netherlands (camp16.nl) and beyond. When not organising events he runs FairSay [http://fairsay.com] - a pioneering campaigning consultancy - which provides training, strategic advice, performance analysis and more.